Vino cotto means cooked wine in Italian. Vino cotto or vincotto, as it is called in other parts of Italy, is traditionally made using grape must – grape juice that has been pressed with the skins and seeds, the first stage in wine making. 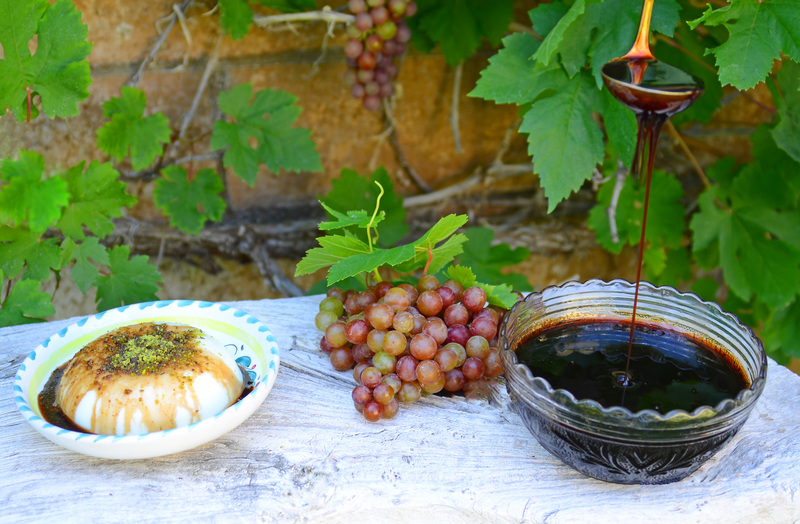 In Sicily, vino cotto is a popular sweetener made by reducing the must until it thickens into a syrup. Not to be confused with a type of wine made in Italy using reduced grape must that is reduced and then fermented or another form of vino cotto made with vinegar. The use of vino cotto as natural sweetener dates to ancient Roman times. It is also used in the Middle East, Turkey, Spain, Greece, Croatia, and other countries surrounding the Mediterranean. Grape molasses, which is essentially vino cotto, is available in Middle Eastern and other specialty markets. It lacks character but it’s good in a pinch if you need it for a recipe. You can make your own vino cotto easily, using pure bottled grape juice from dark grapes. Most bottled grape juices are made using concord grapes and some contain a mixture of several varieties of grapes. Grape must from wine grapes, which is difficult to find, gives the best result. There are numerous uses for vino cotto, and I like to always have some on hand. Sicilians use it as a sweetener in place of honey, drizzled over cooked wheat berries (cuccia), ricotta, or panna cotta. It is also used to make cookies (cuccidati and mustazzoli) and pastries. Some swear by its medicinal properties as a cough syrup, though I haven’t tried that one yet. It’s an excellent substitute for molasses in cookies and cakes. I’ll let you in on a little secret of mine– I use it in place of honey or sugar when making rustic breads. You can also use it in marinades or simply drizzle it over pancakes, or ricotta and figs. Place all ingredients in a 3-quart saucepan and bring to a boil. Cook over medium-high heat until mixture reaches 226-228 degrees F on an instant read thermometer or until mixture is reduced to slightly over 1 cup (about 9 ounces). Remove from heat and strain the vino cotto into a heat-proof bowl. Let cool to room temperature. Place the vino cotto in a glass bottle or jar with a lid and refrigerate. Bring to room temperature before using.